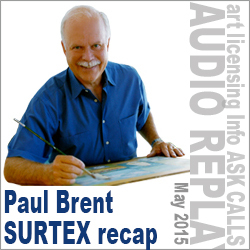 For the past six years, Tara Reed and Paul Brent have brought you a summary and review of each of the past SURTEX shows, including trends and industry updates. 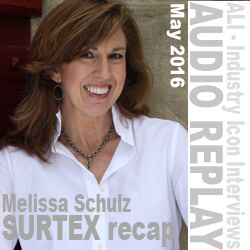 This year, they have passed the torch, so we are blessed with the 2016 report being given by our own Melissa Schulz – co-Founder of the business advisory firm ideaologie and co-Owner of ArtLicensingInfo.com Having spent multiple years as a leader in the world of consumer products, and over 20 years in the licensing industry, Melissa is a devoted follower of the latest and greatest in our industry; making her the ideal person to offer this year’s observations! Typography Takeover! – the key role typography is taking as an art piece in and of itself. Color Coordination – both from observation and a review of the exciting color and design presentation by Pantone Color Institute’s Leatrice Eisman. Iconography Observations – what was showing up at both SURTEX and the National Stationery Show, and what wasn’t! Process Performance – was letterpress still the hot trend for 2016, and what was starting to emerge. Also covered were some general licensing questions raised by the attendees . . .
Is there a trend for a decrease in royalty rates? Has audit language changed to being almost non-existent, to outrageously high (above 10% variance)? Do manufacturers still offer samples with a license agreement? How do you manage a licensee who wants exclusive rights to your images, and wants to hold them off the market for 4 – 6 months waiting for retailer feedback? He talked about trending and classic art categories and colors and icons that he sees coming and going in the trend cycle. What are your top 3 tips for a newbie to prepare for Surtex 2016? How many collections do I need in my portfolio to make the best use of my time when I rent a booth at Surtex? In the current economy, what is the one thing you think is most important for success in this field? How many pieces of art should a typical collection contain? What is your take on mixing both traditional and digital work in a portfolio. How do you handle it when several companies express interest in the same design for the same products? Do you think selling through Print-On-Demand sites, Etsy or other online sales will impact a manufacturers decision to license an artist’s work? Can you please give some suggestions and information about how and where to find a good, qualified Layout Artist and what a typical pay range would be? 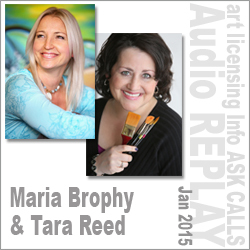 Tara did a recap of the Atlanta Gift Show and talks about what “commercially viable” art might mean… Maria talks about looking at your art as a business and how that changes your behavior and perspective and improves your business. What tips & advice can you offer regarding artists wanting to freelance and generate sales without committing to an agency? One artist sees art on products as quirky but does realistic and another sees art as realistic and does funky… we talk about how people are seeing what is in the market and how to find where you might fit. Do you put every color on a different layer in Photoshop so you can change them and how often are changes requested? What kind of paperwork should I be getting from my agent about royalties earned? How do I know when I’m getting paid unfairly, or could negotiate more if I try? I’m one person, any advice on handling creative development and business activities? What’s the best advice you can give to a newcomer to art licensing? How do I go from traditional artist to licensed? What is the first, most effective, most cost efficient exercise I should do when just starting out wanting to license my artwork? Where do I find Licensors interested in my art where I get paid versus getting an agent who I have to pay to locate one? From your experience, can people find success in licensing doing it part time or is it almost always a full time endeavor? 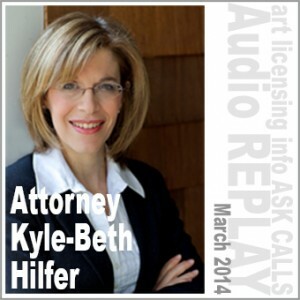 Since I do not plan on having an agent, at what point do I need a licensing attorney? How does one know when they are ready to exhibit at Surtex? What happens when another artist imitates an image with their own work, but obviously copying the original style? The importance of “why” and how that might relate to various questions I’ve seen online about licensing negotiations and royalty audits. Can an artist learn to do their own contracts and where do they get their first contract? When registering copyrights, what is considered “published work”? Do you have to copyright every color way of the same pattern? Does the number of images in a copyright registration affect compensation if there is an infringement? What is involved in registering a trademark and how long does it take? Can you use other’s art (cartoons for example, Batman, Minions, etc) if you are only doing individual pieces of art for sale and not mass producing or is that a copyright infringement? What is the difference between a brand and a property? Will allowing non-profits to use art for t-shirts affect other licensing deals? Is it illegal to use images of celebrities in your work for licensing?